This article was first posted on 12th November 2016. I believe the site’s analysis may confuse two separate ships, which had a similar gross tonnage figure and were built in the same year. The FOOK ON was a lesser-known Hong Kong area passenger ferry and the SHU KWANG was a well known Yangtse tanker. The BAAG records appear to refer to FOOK ON but the photo is of SHU KWANG. Below is the information that I had on each of these ships. I did not know the history of FOOK ON from 1937 to 1944, so Elizabeth’s BAAG material is very enlightening indeed. 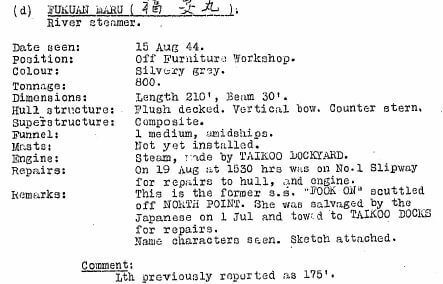 The material suggests the ship was scuttled, raised on 1/7/44 and re-engined with a steam engine built by the Mitsubishi Taikoo dockyard and given a new mast or masts.. Built by Quan Lee or Lau Wa Ping shipyard, Hong Kong, As built, powered by Vickers diesel. Dimensions in feet 160.6×27.1×8.4. Passenger ferry operating in Pearl River Delta area. Listed in Lloyd’s Register books until at least 1936-37. Captured by Japan, renamed. FUKUAN MARU.. 24/12/44 while under IJN control sunk by mine off Palembang, South Sumatra, 4 crew dead. Summer moulded draught not to exceed 8’6”. Built by Yarrow & Co. (1922 Ltd.), Glasgow for Asiatic Petroleum Co. North China, Shanghai. 1940 sold to RN and comm. as aux. 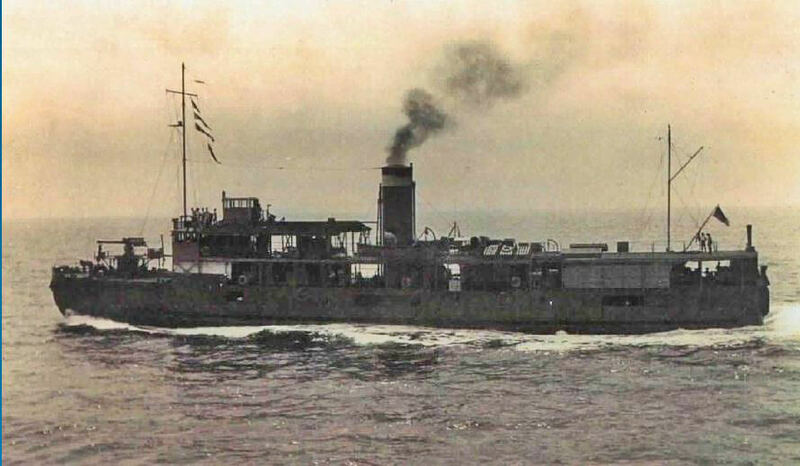 patrol vessel HMS SHU KWANG. 14/2/42 left Singapore for Colombo but several hours later attacked twice in Java Sea by Japanese bombers, 20 dead/273 rescued. Sunk by gunfire from TANJONG PINANG.